There is something zen about sheep quietly moving through a landscape. When the 32,000-acre ranch was established in the late 19th century, herders had the sheep graze an area intensively before moving them on. Today a timed rotational grazing system, with fences instead of herders, provides similar benefits to this land, which receives only about eight to 10 inches of rainfall a year. 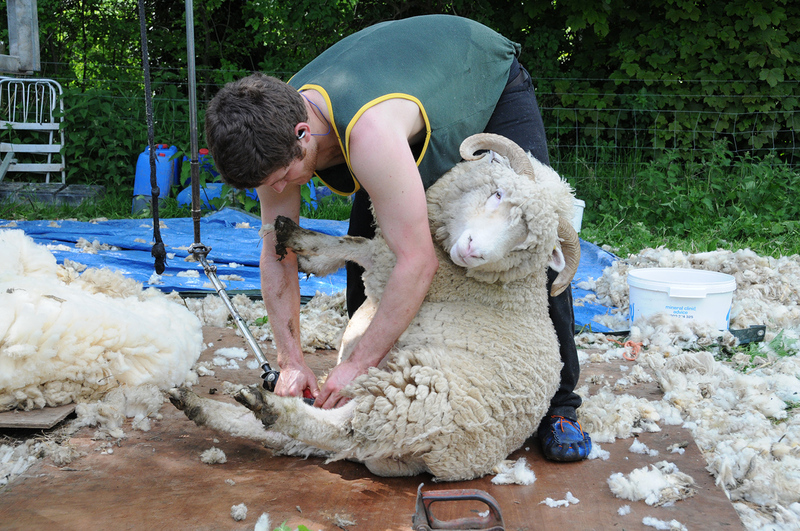 To stay healthy, sheep must be sheared; the fleece of the Carvers’ sheep is spun into yarn and certified to the Responsible Wool Standard, which guarantees good land management and the responsible treatment of animals. That — and more — should be covered by an “organic wool” label. The fact that there is practically no certified organic U.S. wool available has to do with the peculiarities of the National Organic Standards. When these standards were defined by the USDA’s National Organic Standards Board, the focus was on dairy, said Angela Wartes-Kahl, fiber and textiles coordinator at Oregon Tilth. A new standard covering fiber production (which includes wool) has been drawn up. But it’s part of a package of more than a dozen other amendments. The decision to adopt or not adopt the changes will be taken after a 60-day comment period and further consideration. It’s unlikely to happen before the end of 2018 or early next year, said Wartes-Kahl. The problem with the current rules is that sheep often pick up parasites while grazing, and even if they are treated with an orally applied substance permissible in organic agriculture, the lambs and sheep will lose their organic status for good. Neither their wool nor meat can be sold as organic. Theoretically, it would be possible to separately shear lambs who have never needed treatment and sell the wool as organic, but separating the animals at shearing time and working in a way that makes cross-contamination impossible is time consuming and — given the price for wool — not worth the cost. Dufosee alternates sheep and cattle pastures. The animals’ different grazing styles benefit the grasses, and parasites have to go a year without their preferred hosts — which keeps their respective numbers down. Nevertheless the sheep are treated for worms once a year. The treatment is permissible under organic rules. The animals keep their organic status, but the meat cannot be sold as “certified organic” for three months after treatment. As the overall amount of organic wool available is comparatively small, auctions happen infrequently, and the prices achieved in some years don’t even cover the shearing costs. Britain once thrived on wool production for clothing and carpet manufacture. Today sheep wool has become a byproduct of meat production and is more likely to cost farmers money than produce income. Because of Britain’s damp, cold climate, many breeds have coarser, crimpier wool that would make for very scratchy sweaters but excellent carpets, from artistic living room pieces to sturdy carpet tiles for open-plan offices and airports. But long lasting as such carpets may be, on price they can’t compete with artificial fibers. Today, one would be hard pressed to even find a producer of organic wool carpets in the U.K. Farmers like Dufosee are disheartened by the general lack of knowledge about wool: it is dirt and water resistant — a good airing will often be as efficient as a wash. Home textiles made from wool are naturally fire retardant and don’t have to be chemically treated. Each wool fiber has a slight curl or “crimp,” which traps air and gives wool excellent temperature balancing properties. Their coat equips sheep to deal with the huge temperature differences they encounter in mountainous and semi-desert climate zones: wool keeps them warm at night and cool during the day. 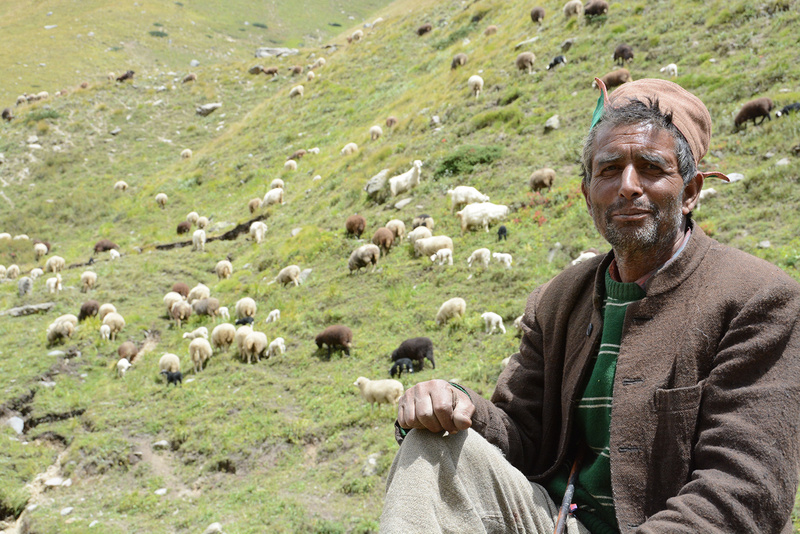 In India, people living in the valleys of the upper Himalayan mountain ranges still consider their sheep a vital part of their lives: the animals provide income, food and wool for clothing, bedding, carpets and insulation. The economy of the region centers on sheep and fruit orchards. Apples can grow at an altitude of 10,000 feet. Since 2016, about 30,000 sheep in the Sangla and neighboring Rohru Valley in the state of Himachal Pradesh have received organic certification. The villagers in these remote valleys pool their sheep and some goats to herds of 600 to 900 animals and employ skilled herders to look after them. They spend the summers on the high mountain meadows at altitudes of around 15,000 feet — as the crow flies, it’s only about 30 miles to the Chinese border. At these altitudes winter sets in early. From November to May, the valleys are buried under a thick layer of snow, with villages sometimes inaccessible for weeks. The sheep leave for winter pastures in lower lying, warmer valleys before the weather turns in late September. They are hardy animals, a cross of Rambouillet — famous for their soft merino wool — and a local breed, Rampur Bushair, which is not only perfectly suited to high altitudes and rough climate but is also known for its excellent meat quality. Herders and shearers clip the sheep twice a year, before they start the 200-mile journey down the mountains and in spring before they return. Owners have to register their sheep with the state department of agriculture, which allocates not just summer and winter pastures but also the specific trails the herds have to follow for the spring and fall migration. Mountain and lowland pastures, as well as the migratory routes (defined through maps and GPS coordinates), have been certified as organic, and the state veterinarians (who routinely check the health of the herds) use only treatments permitted under organic management. Owners and herders are not the only ones who benefit from organic meat and wool. Over the last two decades, consumers in India have become increasingly aware of food contamination through pesticide and herbicide residue. Organic farm stands and supermarkets can be found everywhere, and customers with just a little extra income are willing to pay a premium. Lack of infrastructure, such as cool storage, combined with bad roads and long distances make sales of organic meat from the Himalayas a challenge, but wool may soon help solve the problem. The temperature-balancing quality of wool can be used in transportation. From milk, meat and dairy products to vaccines, many goods need to be kept cool but not frozen. Tests have shown that wool can maintain temperatures of 40 to 77 degrees Fahrenheit for 300 hours. Add some ice, and wool will keep the temperature in the 35 to 46 degrees Fahrenheit range for 150 hours. That’s better than what can be achieved with polystyrene boxes. In the U.K., farmers already use wool-lined boxes for mail-order deliveries and to transport temperature-sensitive animal vaccines destined for remote farms on islands off the coast of northern Scotland. All it takes is a cardboard box, ice and wool. What does the wool lining look like? Think of air cushions similar to bubble wrap, but with larger, thinner pockets filled with clean, carded wool. The bigger the box, the longer the temperature within can be maintained. The wool lining does not take much space. By contrast, because of its thick walls, a polystyrene box of the same size will hold far less content. And unlike polystyrene and polyethylene, which are made from fossil fuel, wool is a renewable resource that is also biodegradable. Who knew sheep could be this cool?